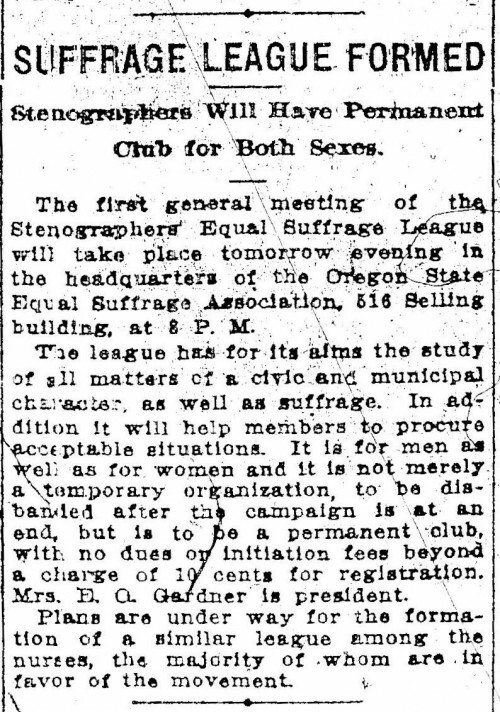 The first general meeting of the Stenographers Equal Suffrage League will take place tomorrow evening in the headquarters of the Oregon State Equal Suffrage Association, 516 Selling building, at 8 P. M.
The league has for its aims the study of all matters of a civic and municipal characters as well as suffrage. In addition it will help members to procure acceptable situations. It is for men as well as for women and it is not merely a temporary organization, to be disbanded after the campaign is at an end, but is to be a permanent club, with no dues or initiation fees beyond a charge of 10 cents for registration. Mrs. E. O. Gardener is president. Plans are under way for the formation of a similar league among the nurses, the majority of whom are in favor of the movement.